These days the fashion calendar is showing Milan. 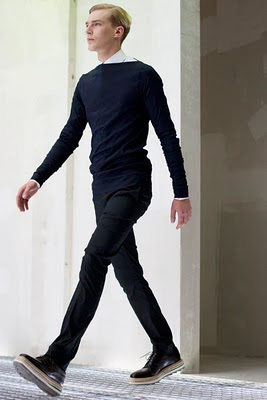 The menswear collections for 2010 are under full sway and the usual protagonists jostle for their place in the sun. The image that caught my eye among hundreds of photos covering the event in various websites and blogs is the one above, from the master of the fashion photo, Mr. Sartorialist himself, Scott Schuman. The restrained elegance and minimalism of Prada is paired with small details that make this look fresh and coveted. This is the way to go, no gimmicks, no frills. And you can duplicate it at home without paying an arm and a leg. Photo courtesy of The Sartorialist. All rights reserved. Funny, we chose the same picture, adn I discovered your blog today loking for Patou.